Raised in both Australia and the United States, I became interested in pottery while studying philosophy at the University of Wollongong in Australia. Becoming ever more dissatisfied with intellectual answers to philosophical questions, I began engaging these issues on a practical level, an approach that emphasized direct experience of life. Finding a natural ally in Asian philosophy and religion, I became increasingly attracted to Chan Buddhism and its relationship to culture and society. Of particular interest was the Japanese tea ceremony, the ceramic vessels associated with this ritual, and the lives of the craftsmen who created these vessels. After completing my undergraduate degree I returned to the United States to learn to make pots. After completing a three-year apprenticeship with Mark Shapiro last fall, I am working with several potters before beginning a year long residency at the Red Lodge Clay center in September. The intersection between ideas and experiences continually informs my life and work. Conversations regarding the significance of handmade pottery in contemporary society are both useful and beneficial, though a thoroughly different activity than actually using pots in one’s life. In other words, a map is different from the terrain it symbolizes. I consider myself both cartographer and explorer. While outside the studio, reflecting on concepts and techniques pushes my work in new directions. Inside the studio I respond directly to the materials, thereby developing sensitivity to their inherent qualities. To intimately experience life is the wellspring of a meaningful existence. We all must eat and drink, though the way we approach these activities matters. For me it is the everyday details of life that hold the most significance, so mindfulness of the processes by which my pots are created is important. Subtleties of touch and gesture form the foundation of my work. Soft, quite colors are used to accentuate the food, drinks or flowers placed inside. Throughout the making process I like to keep things simple taking things as they come and accepting them for what they are. I am not interested in making beautiful pots, unique pots, or important pots… these judgments I find best left to others. I am focused instead on openly accepting the process of making, thereby allowing this process to express its nature with a sense of ease and spontaneously. I am not trying to communicate a concept, nor highlight a particular technique. Concepts, techniques, and even the objects themselves are secondary to the experiences they afford. 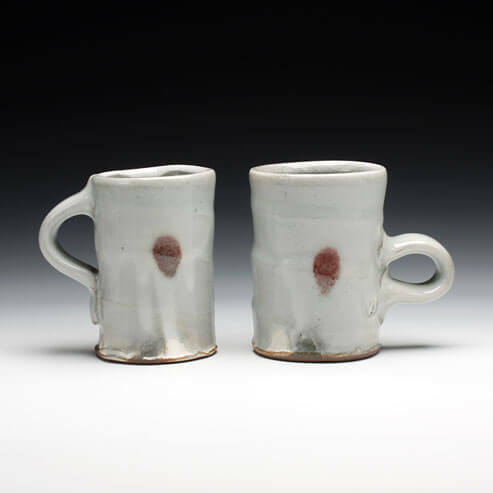 It is the experience of drinking warm coffee from a handmade mug, or sharing a meal with friends and family using sturdy, wheel thrown plates that invigorates my work. I see myself as a toolmaker, creating tools for the art of living. I do not want my work to stand apart… an object to be perceived. Rather, it is my hope that these pots will be seamlessly integrated into the flow of life, conversing with their users in an intimate way. Ultimately I hope my work goes straight to the heart.